I hope that at least a couple of you got to read Dark Lord of Derkholm this month. 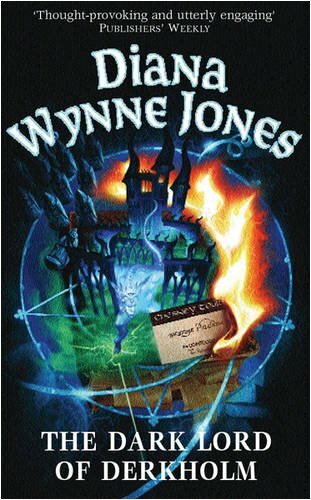 It is honestly one of my favorite Diana Wynne Jones books and I loved this reread. The thing with this book is that it's high fantasy and a send-up of that genre all at once. This is the cover that I have and, honestly, if it wasn't DWJ, I would never have picked up a book that looked like this. This is one brief scene in the story and, frankly, is one of my least favorites. Is there a griffin in the story? Yes. But there are actually three others and, much of the time, it's the dynamics between the four young creatures *and* their two human siblings that is the most interesting thing happening. 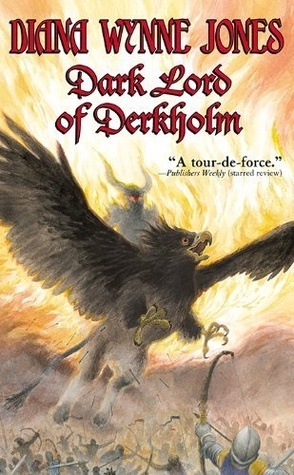 This cover makes Kit (the griffin shown) look evil and like he is the main character of the book, neither of which is true. I might have picked up a book with this cover. It's got some vague magic-y, castle-y stuff going on. However, "thought-provoking and utterly engaging" leaves out so much of what this story is. They need to add "hilarious and complicated and smart and inventive" and probably a few more adjectives as well. Because it's the way that Diana weaves together fantasy tropes, sometimes poking fun (like naming a male dwarf Galadriel!) but also exploring which tropes work and why. 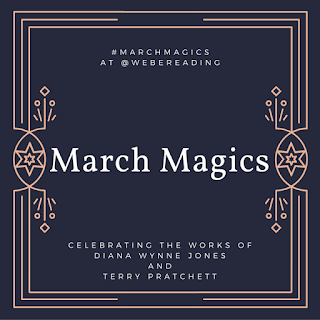 The main event of the story is that there are parallel worlds and a man named Mr. Chesney sends "Pilgrim Parties" from his world into this one and expects them to have a certain, stereotypical experience of pirates and dragons and enchantresses and dark wizards. All of the reasons why this is silly soon become apparent. And, while the castle and dragon wouldn't necessarily grab me on this one, Neil's endorsement would have. And dragons are just the tip of magic wand when it comes to fantastical creatures in this story. Derk is a breeder of interesting creatures, from flying pigs and horses to cannibalistic sheep. Just the things that happen when these sorts of animals get loose is enough to make this one of Diana's funniest books. What do you think of the way DWJ skewers tropes? Is there one of these that is your favorite? Mine is when the elves show up all serene and serious and tall, just as expected, only to bust out laughing until they are in tears. Which of Derk's experimental animals would you like most to have one of? I know I would definitely not want an invisible cat! I can see mine and yet they still manage to trip me up almost daily. The extra intelligent dogs were cool though. One of the common complaints about DWJ stories is that the endings are a bit too fast and furious. Did you feel that way with this story? Did all of your questions get answered? Well, I definitely had question hanging on in my mind at the end. Luckily, she did write a sequel to this book, Year of the Griffin, which answers many of the questions. It also gives a chance to spend a bit more time with some of this amazing group. But the wrapping up of all of the human, dragon, and demon stories was a whirlwind! Feel free to discuss anything else you thought of while reading. 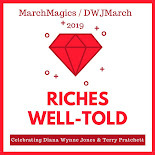 Also, remember to join me on Twitter on Saturday for the Diana Wynne Jones Twitter Party! 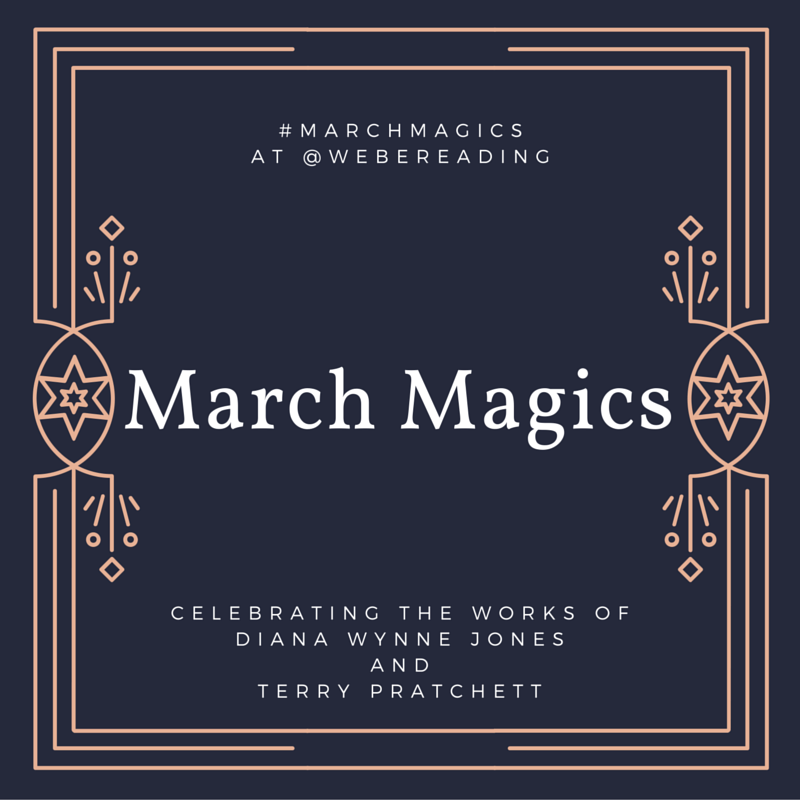 I had a lot of fun with the Pratchett one, featuring some of his best quotes throughout the day and having lots of people join in. For DWJ, I'm probably going to highlight books as well! I ran the last party from midnight Eastern to midnight Pacific so it was actually 27 hours long but that seemed right so I'll do it again. The books is definitely chaotic at first with a lot of different plots starting at once. I hope you do try it again later though! They're the best! It made me immediately like them. I want a griffin! And the intelligent pigeons would be rather useful. (Was that in this book? I did not actually get around to rereading it.) I also like how all the wizards have to have beards, but it was Jean who reminded me of that. Derk was planning the pigeons in this one. And yes, a griffin would be amazing. But would you own it or would it just be your friend or sibling? Male or female? Made with your own DNA? So many things to think about! The griffins are children, not pets, so I'd love to have one as a friend. I wish I could go to college with Elda. I want the clever pigeons! The clever messenger pigeons are so useful. I haven't manage to reread this one yet, but I have to pipe in because it's one of my all-time favourite books! What I love is that it isn't just skewering fantasy tropes (though it does that brilliantly): it's also skewering the real-world tourist industry, where people sign up to have "authentic" experiences and then get disappointed if their experience of someone else's culture doesn't match their preconceived notions. Plus it's also a wonderful family story, with very realistic sibling and parent-child (and parent-parent) dynamics. And I loved Blade, with all his insecurities and frustrations. Okay, really just want to go reread this now! I agree with all of this! It's an incredibly smart book and fun to boot.